देवनागरी | Devanagari - Why Can't I see the Hindi section? This website will help you read text, mail, news, web pages in Hindi, Konkani, Marathi, Nepali, Sanskrit and other languages using the devanagari script, on Unix/ GNU/Linux, Windows or Mac. There is also a list of Devanagari Fonts that you can download. Also find out why unicode encoded fonts make your content easier to find. You will find here tips to publish or host your content in Hindi, via usenet, email, website, weblog or a journal very easily. If you do not find what you are looking for, you may ask at the mailing list, or search the archives. You are free to republish the content of this website under the terms of the GNU FDL. If you have a suggestion, question or correction please contact the webmaster. Why these fonts? Why not susha, surekh, agra, ... ? These fonts are utf-8 encoded, which means they use the unicode character encoding. Unicode makes your pages automatically searchable.What's the point of a website that people can't find thru search engines? That's why the newer sites are in utf-8 encoding. The other fonts were great, untill we didn't have a standard. They provided the base for the standardization, but using these fonts makes sites unsearchable, as opposed to unicoded sites, for example, look at the search results for राम ram or தமிழ் tamil. Thanks to Sunil Bhadekar for the screen shots. 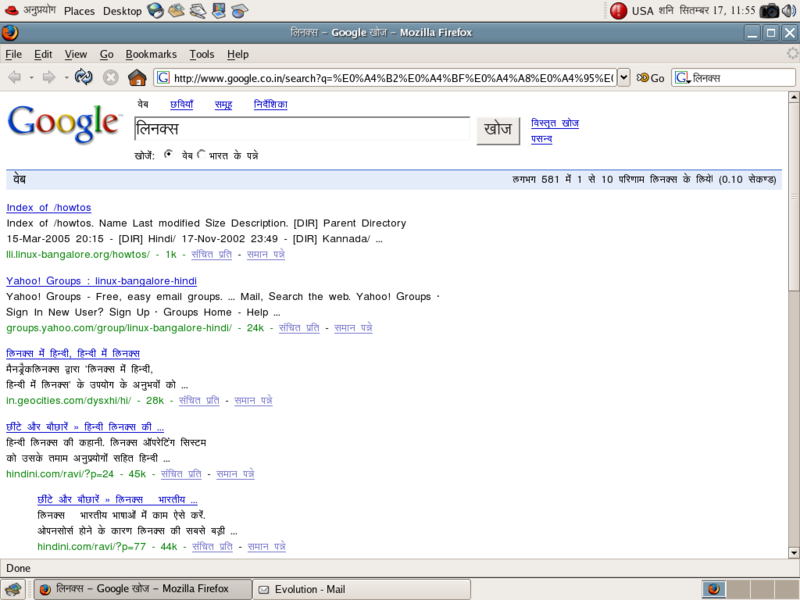 A search for "लिनक्स"linux gives you relevant results. How do I create a hindi web page? for the paragraph containing Hindi text. To help people view your page, you can add a link to this page. Again, replace "Hindi" by language of your choice. Visitors can click on this page and view the help. Is there a directory of websites in Hindi? The Open Directory Project is one such directory. It is maintained by volunteer editors. You can also submit your website, or any Hindi website you like to the directory and also help maintain it, by becoming a volunteer. Note that as with English language websites, you don't need to be an editor to get your site listed, and also that submitting a site doesn't mean that it would get listed. For more information, you can post questions to the directory's public forum. If you know of any other web directories that list Hindi sites, please let us know. Is there a search engine for Hindi websites? But websites would be picked up by search engines only if there are known encodings. For devanagari, the only recognized encoding is utf-8. That's one more reason to have content in a standard encoding.If you know of any other search engines that are good for searching devanagari content, please let us know. I couldn't find the Hindi content I wanted through the search engine. What can I do? That's probably because no one has put up that information on the internet yet. You might want to start working on it. Good luck, and if you have any questions or need help on a devanagari website project, feel free to ask. If you were looking for your own Hindi website via a search engine but couldn't find it, perhaps it needs to be optimized. © , 2002-2014, CSS © w3c .